Imagination, curiosity, and creativity are essential traits, attributes, and skills for successful veterinary professionals (and people). 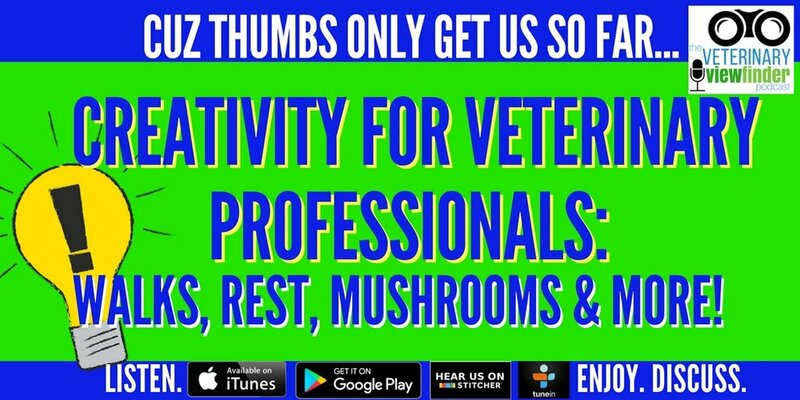 This week host veterinarians Ernie Ward an Cyndie Courtney along with registered veterinary technician Beckie Mossor explore the creative side of veterinary medicine. The trio traverse Thoreau’s take on inspiration and creativity, share tales of imaginative solutions discovered in exam rooms, surgical suites, and strapped onto turtle shells, and simple steps to encourage your creativity. Dr. Ward reveals what a nootropic stack is, shares some of his favorite freaky supplements and rituals, and the gang goes bonkers over people who shut down ideas. This episode is entertaining, educational, an maybe a little weird when Ernie gets in his infrared sauna to meditate and take mushroom extracts. If this episode isn’t worth a 5-star iTunes rating, I don’t know what is. Do us a solid and help us grow by subscribing, sharing, and taking 30-seconds to leave a review on your favorite podcast portal. Hang with us on Instagram, Facebook and Twitter.